Join us for this special CLC Brown Bag Lunch reading and Secret Feminist Agenda podcast recording with Hannah McGregor and Chelsea Vowel. Hannah McGregor is an Assistant Professor of Publishing at Simon Fraser University, a feminist podcaster, and a CanLit killjoy. She co-hosts the popular Harry Potter podcast Witch, Please, and hosts the slightly less popular podcast Secret Feminist Agenda, a weekly discussion of the insidious, nefarious, insurgent, and mundane ways were enact our feminism in our daily lives. She lives in Vancouver on the territory of the Musqueam, Squamish, and Tsleil-Waututh, and has two cats; one is named after a poet, and the other is named after a breakfast. Chelsea Vowel is Métis from manitow-sâkahikan (Lac Ste. Anne), Alberta, currently residing in amiskwacîwâskahikan (Edmonton). Mother to six girls, she has a Bed and LLB, and is currently a graduate student and online Cree language coordinator at the Faculty of Native Studies at the University of Alberta. Chelsea is a public intellectual, writer, and educator whose work intersects language, gender, Métis self-determination, and resurgence. Co-host of the Indigenous feminist sci-fi podcast Métis in Space and author of Indigenous Writes: A Guide to First Nations, Métis & Inuit Issues in Canada, Chelsea blogs at apihtawikosisan.com and makes legendary bannock. Books will be sold by Glass Bookshop. CanLit—the commonly used short form for English Canadian Literature as a cultural formation and industry—has been at the heart of several recent public controversies. Why? Because CanLit is breaking open to reveal the accepted injustices at its heart. It is imperative that these public controversies and the issues that sparked them be subject to careful and thorough discussion and critique. Refuse: CanLit in Ruins provides a critical and historical context to help readers understand conversations happening about CanLit presently. Join us for a cinq à sept to celebrate the launch of this important and powerful volume, co-edited by Hannah McGregor, Julie Rak, and Erin Wunker, at its Edmonton launch on Wednesday, January 16, 2019. 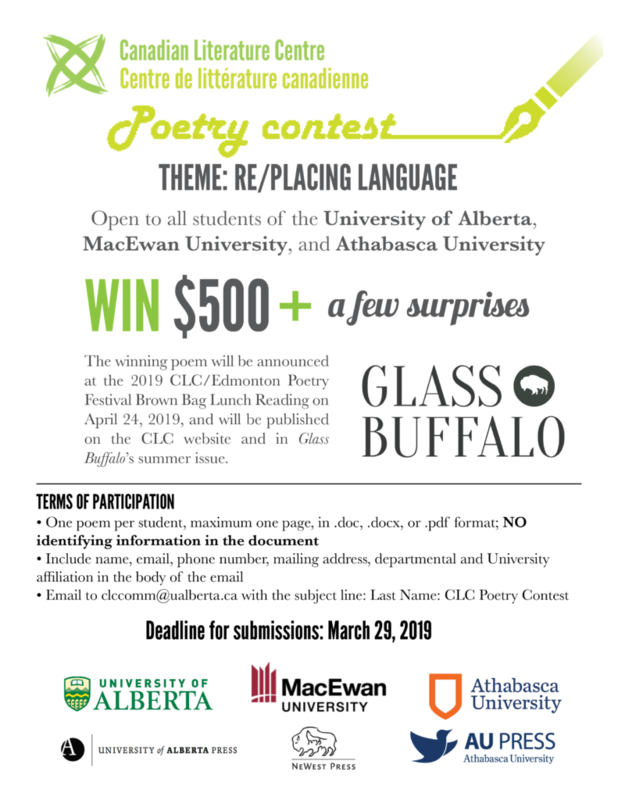 From 5:00 – 7:00 PM, in the Student Lounge of the University of Alberta’s Old Arts Building, you’ll hear amazing work of refusal and hope from CJ Bogle, Marilyn Dumont, Nikki Reimer and Chelsea Vowel (among others), and have the chance to mingle and discuss Canadian literature over drinks and bites. Don’t miss it! Join us for this CLC Brown Bag Lunch reading with poet, novelist, and memoirist Amber Dawn. Don’t miss this CLC Brown Bag Lunch reading with Joshua Whitehead! Joshua Whitehead is an Oji-Cree/nehiyaw, Two-Spirit/Indigiqueer member of Peguis First Nation (Treaty 1). He is the author of the novel Jonny Appleseed (Arsenal Pulp Press, 2018), longlisted for the Scotiabank Giller Prized and a finalist for Governor General’s Literary Award for Fiction. He is also author of the poetry collection full-metal indigiqueer (Talonbooks, 2017) and the winner of the Governor General’s History Award for the Indigenous Arts and Stories Challenge in 2016. Currently he is working on a PhD in Indigenous Literatures and Cultures in the University of Calgary’s English department (Treaty 7). Don’t miss the 2019 CLC Kreisel Lecture to be delivered by Dionne Brand. Internationally acclaimed poet and novelist Dionne Brand, winner of the Griffin Poetry Prize and the Governor General’s Award, will give a lecture titled “An Autobiography of the Autobiography of Reading.” Brand will be introduced by bestselling author Lawrence Hill. The CLC continues its commitment to maintaining the legacy of Henry Kreisel through its annual CLC Kreisel Lecture series. A forum for open, inclusive critical thinking and cultural engagement, the CLC Kreisel Lecture series is a tribute to Henry Kreisel himself. Past presenters in the series include Michael Crummey, Heather O’Neill, Lynn Coady, Tomson Highway, Esi Edugyan, Lawrence Hill, and Eden Robinson. 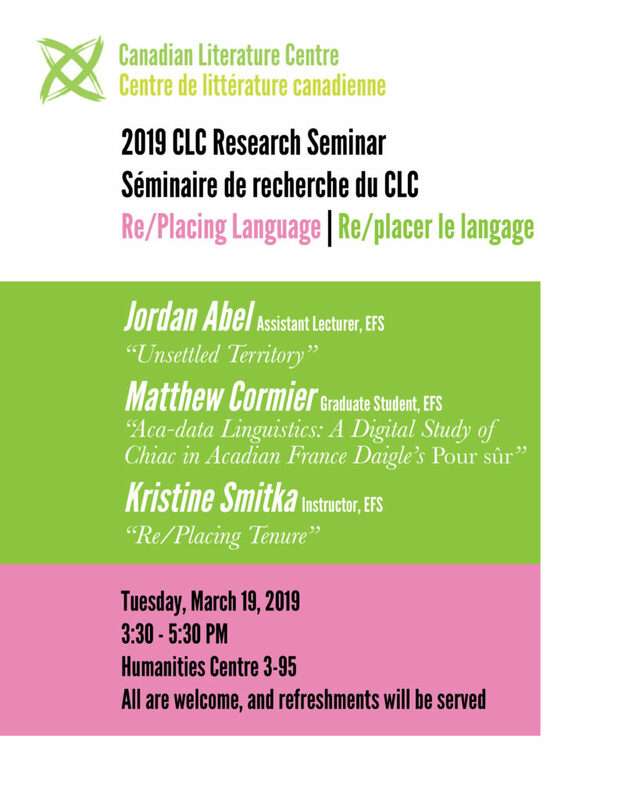 Like the twelve previous CLC Kreisel Lectures, Brand’s talk will be published in the CLC Kreisel Lecture Series by the University of Alberta Press, in the same fashion as the CBC Massey Lecture Series. The lecture will be recorded and broadcast by CBC Radio One “Ideas.” Bestselling author Lawrence Hill will introduce Brand’s lecture. Dionne Brand’s literary credentials are legion. Her 2010 book of poetry, Ossuaries, won the Griffin Poetry Prize, and her other accolades include the Governor General’s Literary Award, the Trillium Book Award and the Pat Lowther Memorial Award. Her novel In Another Place, Not Here was selected as a NYT Book Review Notable Book and a Best Book by the Globe and Mail; At the Full and Change of the Moon was selected a Best Book by the LA Times and What We All Long For won the Toronto Book Award. In 2006, Brand was awarded the Harbourfront Festival Prize for her contribution to the world of books and writing, and was Toronto’s Poet Laureate from 2009 to 2012. In 2017, she was named to the Order of Canada, and 2018 saw the publication of two new titles: Theory and The Blue Clerk. Brand is a Professor in the School of English and Theatre Studies at the University of Guelph. She lives in Toronto. A reception and book signing will follow. Books will be sold by Glass Bookshop. Don’t miss this exciting CLC Brown Bag Lunch reading with bestselling author Lawrence Hill. Author of The Book of Negroes and The Illegal, Hill has been awarded the Rogers/Writers’ Trust Fiction Price, is a two-time CBC Canada Reads winner and Radio Canada’s Le Combat des livres, and the Commonwealth Writers’ Prize. Join us for our annual Edmonton Poetry Festival CLC Brown Bag Lunch Reading! Enjoy readings by NASRA and Ahmed Knowmadic, to be moderated by poet Nisha Patel. Conversation,” and wish to consider its limitations. and critical practices that must be undertaken in relation to communities? participants to consider Indigenous works in an Indigenous language, in French or in English. • the translation of Indigenous languages and/or between colonial languages (L. Moyes; I. • the history of Indigenous literary studies and research methodologies (D. Reder; S.
• editorial tensions (for example in the work of M. Campbell, M. Aodla Freeman, L.
eyed seeing” (First Nations in Quebec and Labrador’s Research Protocol, 2014). either ILSA or APFUCC. Participants must also pay the SSHRC Congress registration fee. person, even in the case of collaborations.